36 Issues of Baseball Digest 1966-1971 Nice conditions, spines are very straight which is rare on square bound digests. May 1966 FN. Oct-Nov 1966 FN. May 1967 FN. Aug 1968 FN. Mar 19 71 FN- Carl Yastrzemski cover. This is a June 1986 Baseball Digest with Eddie Murray of the Baltimore Orioles on the cover. I have 68 Baseball Digest magazines that are all from 1980’s. Most are in good condition. There are a few with no cover. Above-average copy that shows minor wear but is fairly flat and clean with decent eye appeal. Corners may have blunting, cover inks may be less bright or have reduced reflectivity, spine may have a minor roll with a possible 1/4" split and minor color breaks, staples may have minor discoloration, and pages can be tannish but fairly supple. Baseball Digest magazines from the 1980s. The magazines are in great condition with no major flaws whatsoever as shown in the pictures. Lot of 58(!). Baseball Digest Magazines. 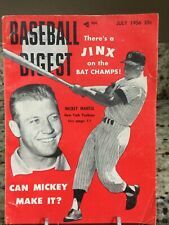 30 Issues of Baseball Digest 1960-1965 Nice conditions, spines are very straight which is rare on square bound digests. Jan 1962 FN. Mar 1962 FN. May 1964 FN. Sep 1965 (2) FN, VG. Sep 1964 FN. Mar 1965 VG. BASEBALL DIGEST . Digest Sized: 5.25" x 7.5". Profile of the Pirates. September 1972. Baseball Digest White Sox Win It All! January 2006 Back Issue. Item in good condition. IN GOOD CONDITION HAS SLIGHT CREASE ON RIGHT TOP CORNER SEE SCAN PAGES ARE GREAT. Complete magazine, April 1985. Perfect condition, no creases, writing or tears. The magazines are in very good shape to fair shape. Issue from 1986 in VG condition with regular wear. Item has normal wear from use. 1951 BASEBALL DIGEST JOE DIMAGGIO COVER NEW YORK YANKEES. Shipped with USPS First Class Package. Five pack lot of great mags. Most have general wear and tear. Free shipping. You never know what you might find. It is very much appreciated! Baseball Digest Magazine August 1966 Mazeroski And Pittsburgh Pirates . Complete magazine, November 1990. Perfect condition, no creases, writing or tears. 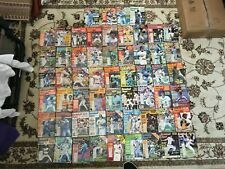 Lot Of 58 1990's Baseball Digest as pictured. . Shipped with USPS Retail Ground. Complete magazine, April 1977. Creasing to corners, otherwise excellent. JUNE 1974 BASEBALL DIGEST MAGAZINE. This is the February, 1965 issue of Baseball Digest in excellent condition. Young Pete Rose of the Cincinnati Reds is featured on the cover leaping over Pittsburgh's Bill Virdon. On the back, there is a sharp photo of 3 of the greatest centerfielders in baseball history - Willie Mays, Joe DiMaggio and Mickey Mantle. 98 page Baseball Digest magazine from May 1962 with Jim Landis of the Chicago White Sox on the front cover and Ralph Houk of the New York Yankees on the back cover. Magazine is in very good condition. 80 page Baseball Digest magazine from May 1949 with Willard Marshall of the New York Giants and Ray Lamanno of the Cincinnati Reds on the front cover and Ted Williams of the Boston Red Sox on the back cover. 1975 Complete Set (12) Baseball Digest Nolan Ryan, Rod Carew, Johnny Bench, Joe Morgan, Catfish Hunter, Fred Lynn, Mike Schmidt. Rare old school Baseball Digest with label pulled off. BASEBALL DIGEST 1974 AND UP. Rare old school Baseball Digest with label, rookie report includes write up on GEORGE BRETT.